In an effort to liven up the process of completing the standard patient questionnaire, Tonic Health has turned the dull document into a fun iPad game. Xconomy.com explained how this start-up is striving to make the healthcare experience much more enjoyable. Over the past year and a half, Tonic Health has been experimenting with applying video gaming and consumer marketing toward the development of improved intake forms that would elicit more thorough information from patients. These updated forms are designed to be filled out with a few strokes on a touchscreen. They are already being tested by the Athena Breast Health Network to screen women for breast cancer risk and keep track of their health in the future. Other healthcare companies have also expressed interest in testing this new software. “When you increase patient engagement, you increase data accuracy, and you increase the hospital’s ability to communicate with that patient,” said Sterling Lanier, co-founder of Tonic Health. Mr. Lanier has a consumer marketing background, yet his pro-bono work in the healthcare industry opened his eyes to the opportunity to jazz up the boring patient questionnaire. His vision came to fruition in the form of an iPad-based system pre-loaded with an interactive patient form that wirelessly transmits the patient’s data to a secured hard drive. He chose to use an iPad instead of an iPhone because of the larger screen. 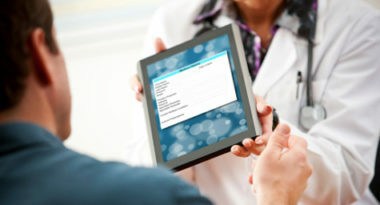 The software is completely compliant with HIPAA rules and is user-friendly even among those who have never used an iPad. While there is an initial investment and the cost of an annual software license, the Tonic system should quickly pay for itself by saving companies the cost of data errors and generating referrals from satisfied patients. The company is still in its beginning stages, but early software tests are generating favorable results. If the technology catches on, Tonic Health may revolutionize data collection for the entire healthcare industry. To discover the latest ways to use digital marketing to capture your patients’ attention, contact MDG Advertising today at 561-338-7797 or visit mdgadvertising.com.